Travelling on the 'Limon Express' is a pleasant and fascinating excursion, along the Costa Blanca. It offers a five-hour journey between Alicante and Denia, through Benidorm, Altea, Penon de Ifach and Teulada, and other natural places you can't otherwise reach by car. This old tourist train stops in Gata de Gorgos where passengers visit a guitar factory and are shown typical handicraft. On the way back, going South, passengers can enjoy the wonderful west Mediterranean landscape from great heights, with views of the coastline, while sparkling wine is served - a lovely day out for all the family! Over a distance of 40 miles, the train runs through a wide range of landscapes, from the plains between Altea and Benidorm, under the cliffs of the Sierra Bernia and Barranco del Mascarat, Peñón de Ifach, this forms part of an area called Marina Alta. The return trip to Alicante used to be done at a slower speed than the first part of the journey, so travellers can enjoy the spectacular scenery. 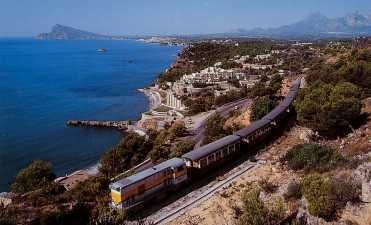 Spain’s first tourist train, which came into service in Benidorm in 1971, the Lemon Express was the idea of a British man, David Simpson, who had the original idea of running the tourist train between Benidorm and Gata de Gorgos, rescuing old carriages from the Carcagante-Denia line before they were scrapped. The line was promoted as a line of love, and became better known outside Spain than locally. Using old carriages with balconies at each end, and initially he had wanted to use a steam locomotive to power it, but in the end settled for three Alsthom diesel engines that were made in Bilbao in the 1950's. Once he had assembled the pieces for his train, Mr Simpson carried out his idea: it would chug along at speeds between 20 and 30 Kilometres an hour, and do the daily journey between Benidorm and Gata de Gorgos, filled with tourists. The train became a sensation, and a real first for the Costa Blanca. When Mr Simpson retired, it fell to Rudi Meyers to continue the train service, which he has done for the last eighteen years. The narrow gauge train service is run by FGV, which stands for 'Ferrocarrils de la Generalitat Valenciana' which translates loosely to Valencia Railways. Check out the FGV website for more information on the service they provide.